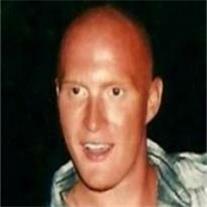 Brett Robert W Taylor, age 27, of Queen Creek, AZ, went home to be with the Lord on Monday, February 20, 2012. He was born March 8, 1984, in Aurora, IL. Brett is survived by his parents Robert and Sandra Taylor; his sisters Beckie, Brenda, Kelle; brothers Ryan (Beth), Ronald, Nick; his sweetheart Jeri; son Shane; grandmother Louise; 11 nieces and nephews, and many aunts and uncles. Gone but not forgotten. Services will be Sunday, February 26, 2012 at 10 AM at Bunker’s Garden Chapel, 33 N. Centennial Way in Mesa.